Accra, Jan. 19, GNA - The ever-lucrative annual Top Four Soccer Tournament organised by the Ghana League Clubs Association (GHALCA) for the best four clubs in the country returns at the weekend with attractive and thrilling fixtures. 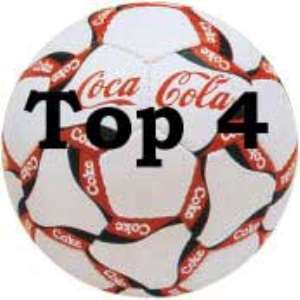 The tournament, which is in its fourth year has seen some significant improvement as Coca Cola Company Limited have retained their status as the title sponsors with a package of 1.4 billion cedis with Kpando Heart of Lions becoming the debutants. The tournament set to kick-start on Saturday and Sunday will see Confederation Cup champions, Accra Hearts of Oak trekking to Kumasi to battle defending Champions, King Faisal with Heart of Lions playing host to Kotoko at the Accra Sports Stadium. With a mouth watering 250 million cedis appearance fee for each of the clubs as well as 30 per cent of the gate proceeds going to each club coupled with the fiery fixtures, one expects nothing but great showpiece of football among the nations four best teams. King Faisal seem to be the only participant with the biggest responsibility of retaining the title as the club has to prove to all that its conquest in the 2004 edition was no fluke. The Alhaji Gruzah' boys, aside from playing under a different technical director, Francis Oti-Akenten will miss some of its key players such as Hamza Mohammed, Kojo Poku and Abass Inusah as the trio played a key role in the success story of the club last season. Noted with the track record of unearthing new talents, one expects nothing but another bunch of fine talents to team up with the likes of Eric Gawu, Abubakari Yahuza, Iliasu Shilla, Bobby Ansah and Owusu Ampem among others to keep their championship aspirations on course, though they will be testing their strength against high flying Accra Hearts of Oak. The Phobians on the other hand are out again on another mission at the Kumasi Sports Stadium this time against the Gruzah boys. Faisal last year held Hearts to a goalless draw game in Accra and defeated them 2-1 at the Kumasi Sports Stadium and this the Phobians are out to avenge when they come up against their opponents. Being the maiden winners of the competition, the subsequent events have been a nightmare for them, but as they continue to ride high on the success chalked in the Confederation Cup competition, the Phobians have not hidden their intention to teach their opponents a soccer lesson. Hearts will once again bank on the experience of Dan Quaye, Adjah Tetteh, Amankwah Mireku, Osei Kuffour and Don Bortey together with the resilience of Eric Nyarko, Francis Bossman, Prince Tagoe and Michael Donkor to carry out their mission to reclaim their glory in the competition. Aside the experience and resilience, which played a key factor in their Confederation Cup matches, Hearts will once again have the opportunity of taking sound technical guidance from their master tactician, Sir Cecil Jones Attuquayefio in their quest to win the trophy for the second time. Kumasi Asante Kotoko who are yet to recover from the shocking defeat suffered at the hands of Accra Hearts of Oak in the Confederation Cup have had their problems worsened by the exodus train, resignation, injury and absenteeism of their players. The 2003 Top Four Champions are reported to be losing key players Charles Taylor and Frank Osei who are on their way to Tunisia to join Etoile Du Sahel, whilst their livewire, Steven Oduro is heading for South Africa to pitch camp with SuperSport. Goalkeeper George Owu is also said to be cooling off in Takoradi after the defeat of the club in the continental competition, whilst skipper Joe Hendricks is alleged to have resigned leaving the Club badly depleted. The badly bruised Fabulous lads will therefore go into the tournament with the likes of William Thompson, Dan Acquah, Elvis Opoku, Edmund Owusu Ansah, Dan Yeboah and Burkinabe import, Aliu Ouadragou with the hopes of turning their cry into joy by winning the Top Four trophy to compensate their hungry fans. For debutants Heart of Lions, the tournament will serve as a moment of truth for them as many believe their success in the 2004 zonal league was a fluke. The Kpando-based Club has therefore vowed to continue with their surprise package by picking up the ultimate prize in the tournament. Coach Bashiru Hayford is also out to prove a point as to why he managed to be the only coach to be short-listed among two other foreign coaches by the Ghana Football Association (GFA) for the Black Stars job late last year. These are the factors that are going to play an integral role in the Club's quest for honours in the Coca Cola sponsored competition, though the team will take much inspiration from experienced players like Jacob Nettey and Johnson Eklu with support from Ali Sibah and Taju Dini among others to complete their task. Taking into consideration the above-mentioned factors, the tournament, which ends on March 6, promises to be full of fireworks, rekindling of rivalry and as well as the preparatory grounds for the commencement of the 2005 soccer season.